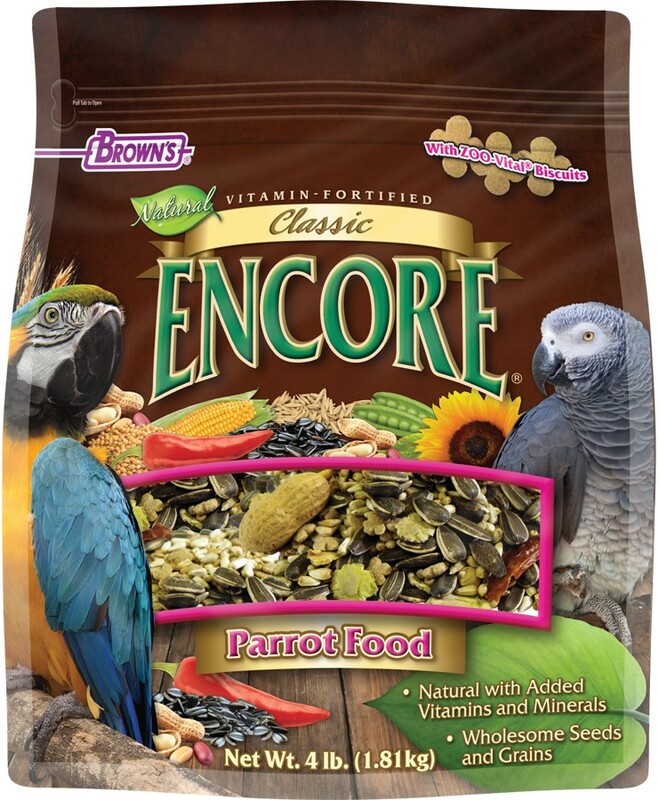 Our Encore® Classic Food is a wholesome, natural daily diet with vitamins and minerals, specifically formulated for parrots. 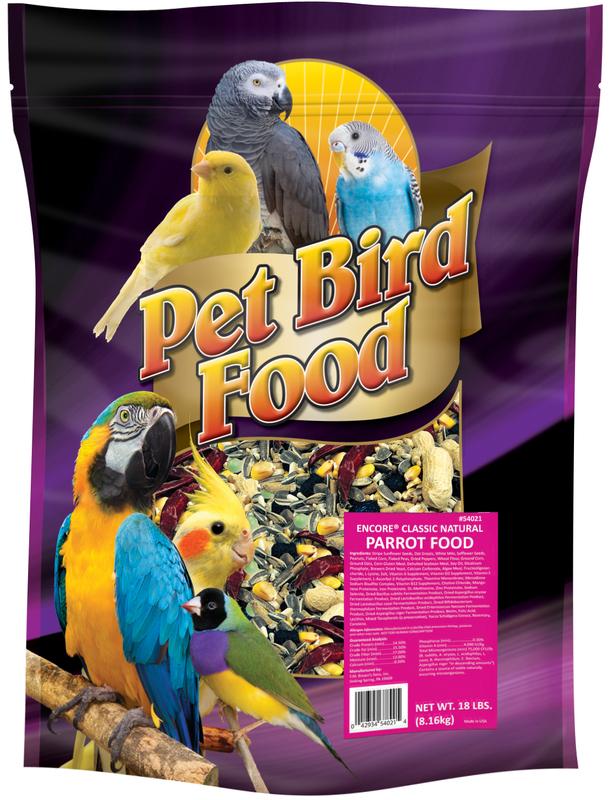 We've blended a variety of appealing flavors, textures and shapes to help relieve cage boredom and stimulate the natural foraging instinct. 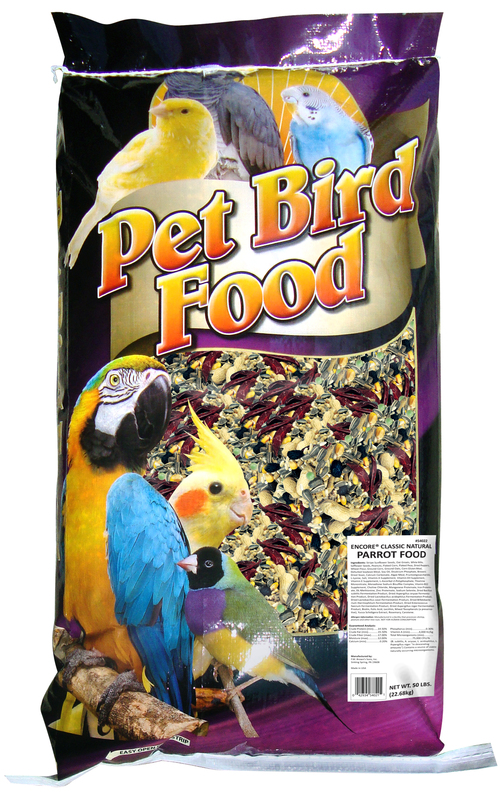 We're sure your parrot will love our food. It's simply a natural fit. 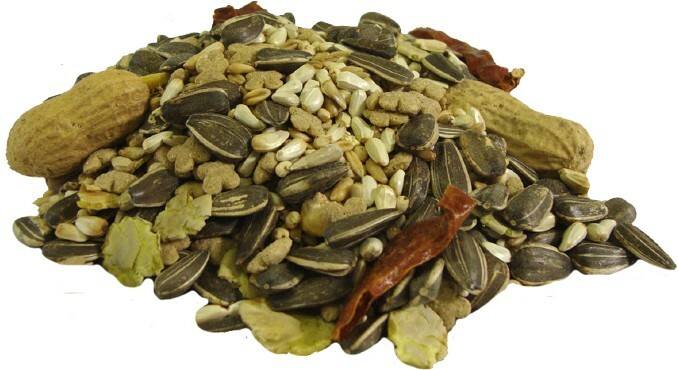 Striped Sunflower Seeds, Oat Groats, White Milo, Safflower Seeds, Peanuts, Flaked Corn, Flaked Peas, Dried Red Chili Peppers, Wheat Flour, Ground Corn, Ground Oats, Corn Gluten Meal, Dehulled Soybean Meal, Soybean Oil (preserved with Mixed Tocopherols), Dicalcium Phosphate, Brewers Dried Yeast, Calcium Carbonate, Menhaden Fish Oil (Source of DHA & Omega 3 Fatty Acids), Fructooligosaccharide, L-Lysine, Salt, Vitamin A Supplement, Vitamin D3 Supplement, Vitamin E Supplement, L-Ascorbyl-2-Polyphosphate (Source of Vitamin C), Thiamine Mononitrate, d-Calcium Pantothenate, Vitamin B12 Supplement, Choline Chloride, Manganese Proteinate, Iron Proteinate, DL-Methionine, Zinc Proteinate, Sodium Selenite, Dried Pediococcus acidilactici Fermentation Product, Biotin, Folic Acid, Lecithin, Mixed Tocopherols (a preservative), Yucca Schidigera Extract, Rosemary Extract, Beta-Carotene. 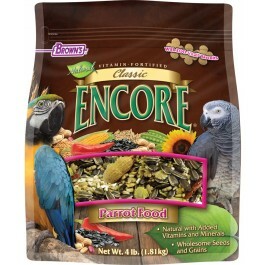 Total Microorganisms (min) 7,500,000 CFU/lb.